Dirty Biter | Where's my backpack? La Conner is a quaint little town on the banks of the Swinomish Channel in the heart of Skagit Valley, Washington. It has a distinctly bohemian feel to it and has been home to several prominent artists, sculptors and writers through the years. On the way back from last year’s Skagit Valley Tulip Festival, my friend Sylvia and I stopped to wander along the main street, filled with restaurants, art galleries and boutiques that meander along the waterfront. We were looking for somewhere to grab a bite to eat when we happened across a rather unusual statue of a dog with a crooked jaw, wonky teeth and his tongue lolling out to one side. Dirty Biter was one of LaConner’s great characters who reminded us of simpler times. He was kind of a funny looking dog because of a broken jaw suffered when he was a puppy, but he was a great town dog who loved everyone. He never thought a thing about going home with anyone who thought they might need a dog for the night. He had his own bar stool and place on the dance floor at his favorite hangout, the 1890’s tavern. He was a real good beggar and his favorite was the tavern’s “Broasted Chicken”, but he never passed up a good steak or a burger. Biter left us one night doing something else he loved, a good old fashion dog fight. 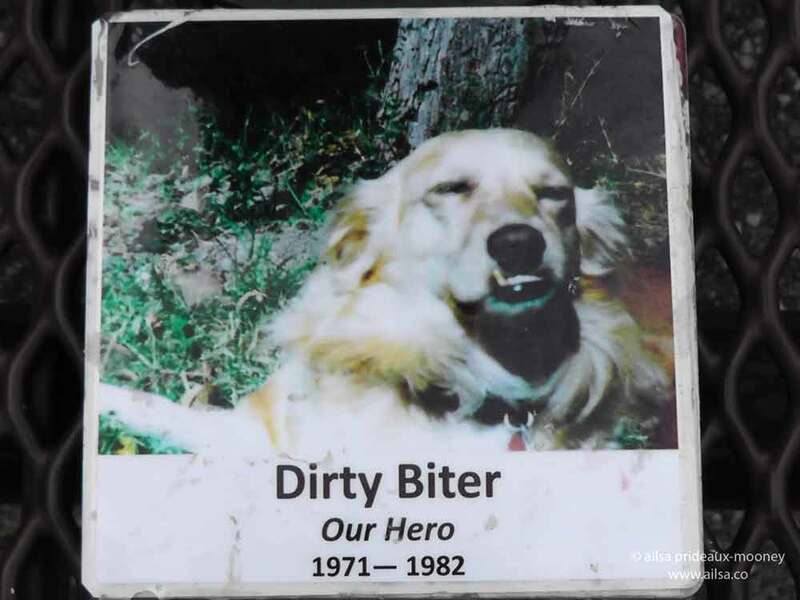 But now Dirty Biter will live on, with this memorial in the newly named Dirty Biter Park, how fitting that it just happens to be right next to the tavern. As I read the placard I imagined Jack Palance doing his best City Slicker Curly the Cowboy’s slow, deep drawl, saying the words with a slight tremble in his voice. 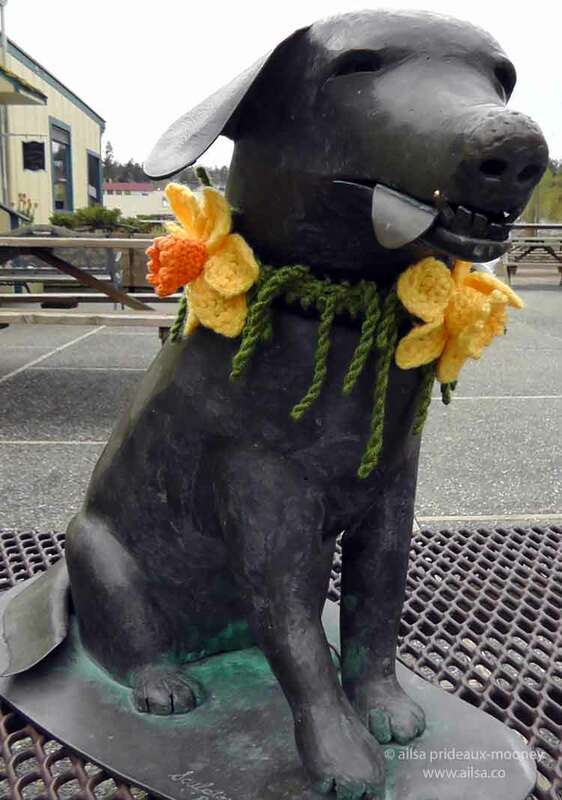 I had already been enchanted by La Conner’s charming ambiance, but now I was falling a little in love with the town that loved a dog so much they gave him a statue and named a park after him. When we’d finished reading, Sylvia and I exchanged glances, then went into the tavern and ordered lunch in memory of a funny-looking little dog with a crooked jaw. This entry was posted in Travel, United States, Washington and tagged history, photography, photos, pictures, travel, writing. Bookmark the permalink. It’s such a sweet statue and yes, that crocheted collar was heartbreaking. RIP Dirty Biter. Adorable story, makes me want to visit the place to meet the people there! very, very sweet. What a wonderful tribute. Glad you enjoyed it, Sue. So very true, Jude – I think that little statue tells more about the spirit of La Conner than any guide book ever could. I’ve been to La Conner plenty of times but didn’t know this story. It’s time for another trip! Ooh, last month? Just in time for the tulip festival, right? I bet the fields looked like rainbows too! Thank you for sharing this bittersweet story.. Life has it’s sadness among the happy too.. Such a lovely story. I know a retriever myself and I realy can imagine that “dirty biter” was a beloved dog because they sure have a social and kind character.